Our new WEEE recycling containers and WEEE storage solutions allow you to store your Waste Electrical and Electronic Equipment in a safe and tidy environment. Pure Planet Recycling has solutions for companies of all sizes in WEEE recycling containers for both indoors and outdoors. Factories, offices, warehouses all benefit from our WEEE recycling containers, prior to our WEEE recycling services. 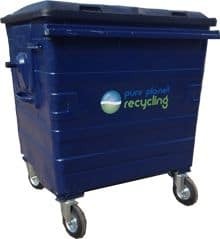 Our branded WEEE recycling containers can be both rented or purchased to provide an individual solution for your company. CRT Monitors, PC Base Units, Printers, PC peripherals, Cables and Leads, telephones, lighting equipment etc. 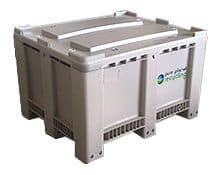 Pure Planet Recycling’s 660 litre pallet WEEE crate is ideal for safely storing WEEE recycling, redundant IT equipment and telecoms equipment prior to our recycling collection. The solid plastic crate has a large 660 litre capacity whilst being still small enough to easily manoeuvre around your place of work. The 660 litre pallet WEEE crate designs allow easy fork lift/pallet truck movement. Ideal to sit in the corner of your warehouse, store room or stock room. The pallet crate is also available with a lid so it can be stored outside. Small household appliances (ie. Hairdryers, Toasters), Hi-Fis, Cables and leads, Lighting, Small electrical equipment. The 660 litre wheelie bin or WEEE bin is ideal for storing smaller domestic electrical items. The wheelie bin is easily moveable to allow flexibility in loading your WEEE bin. The wheelie bin is not ideal for large items such as CRT Monitors or Printers due to the manual loading involved. Our WEEE bin comes with a lockable lid and wheel brakes and can be stored outside. 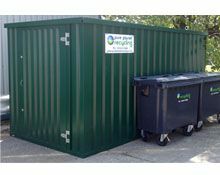 The 1100 litre wheelie bin or WEEE bin is ideal for storing smaller items of electrical waste such as domestic products, kitchen equipment, lighting, etc. Items that can be thrown into the container without breakages occurring. It is easily moveable to allow flexibility in loading your wheelie bin or WEEE bin. The wheelie bin or WEEE bin is not ideal for large items such as CRT Monitors or Printers due to the manual loading involved. The fluorescent lamp tube storage container is an excellent storage solution for companies who generate small quantities of fluorescent tubes, or other waste lamps. The fluorescent lamp tube storage container can be stored vertically to reduce space and is manufactured from a strong extruded polythene. Each fluorescent lamp tube storage container can hold approximately 100 fluorescent lamp tubes. 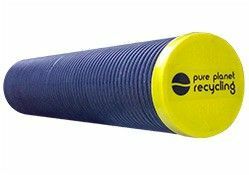 The Pure Planet Recycling fluorescent lamp tube coffin container is an excellent storage solution for offices who generate small quantities of fluorescent tubes, or other waste lamps. 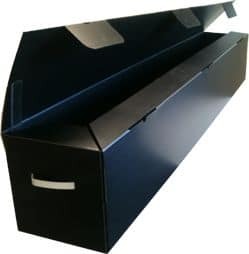 The coffin is made from durable corrugated correx, with handles on either end for carrying. The lamp tube coffin can hold approximately 100-150 6ft light tubes. Fridges, Freezers, White goods, WEEE pallet crates, Large appliances etc. 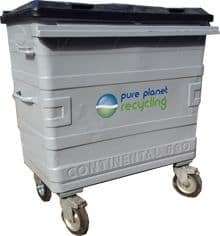 Pure Planet Recycling’s WEEE Container is ideal for safely storing WEEE recycling, redundant IT equipment and telecoms equipment prior to our recycling collection in bulk. The solid steel container allows a walk in, dry and secure solution for WEEE storage. The WEEE container is supplied flat pack and assembled by our own trained staff. The WEEE container can be supplied in 2, 3, or 4 metres in length. Ideal to be placed outside, the WEEE storage container provides a secure WEEE storage solution. Please contact us to discuss your WEEE storage needs and request a quotation.